Maximilian is a prince who loves to talk: No topic is too small, no story too boring. Max's brothers are the opposite--the less said the better. When the king and queen go on a trip and leave the brothers alone, the 3 princes put a spell on Max that limits him to speaking only 9 words at a time. The brothers are delighted: peace and quiet at last! But when a fearsome dignitary arrives, they realize the true value of their brother's insatiable need for information. 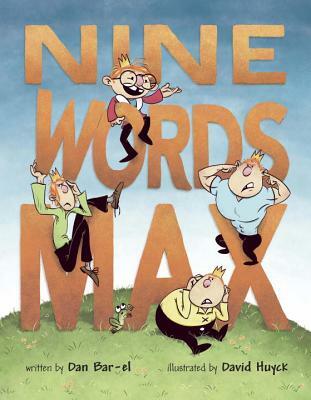 A cautionary tale and a tongue-in-cheek tribute to trivia buffs, Nine Words Max is also a sly satire of our modern world's obsession with media--the 3 reticent princes spend a lot of time sending silly messages, lying around watching puppet shows and speaking in 140 characters or less... This book is a funny, quirky and madcap tale with fantastic illustrations from illustrator David Huyck. DAN BAR-EL is an award-winning children's author, educator and storyteller. His writing includes chapter books, picture books, and most recently, a graphic novel. For the past twenty years, Dan has been working with children ages 3 to 13. He's been a school age childcare provider, a preschool teacher, a creative drama teacher and creative writing teacher. These days, when not writing, travelling around the country presenting his book, storytelling or leading various workshops at schools and libraries, he teaches creative writing courses to children with the organization CWC. Dan lives in Vancouver, BC and shares his life with artist and goldsmith, Dominique Bréchault, and Sasha, the most adorable cat in the known universe. Like Maximilion, Dan is not a man of few words, but no one has had to put a spell on him... yet.